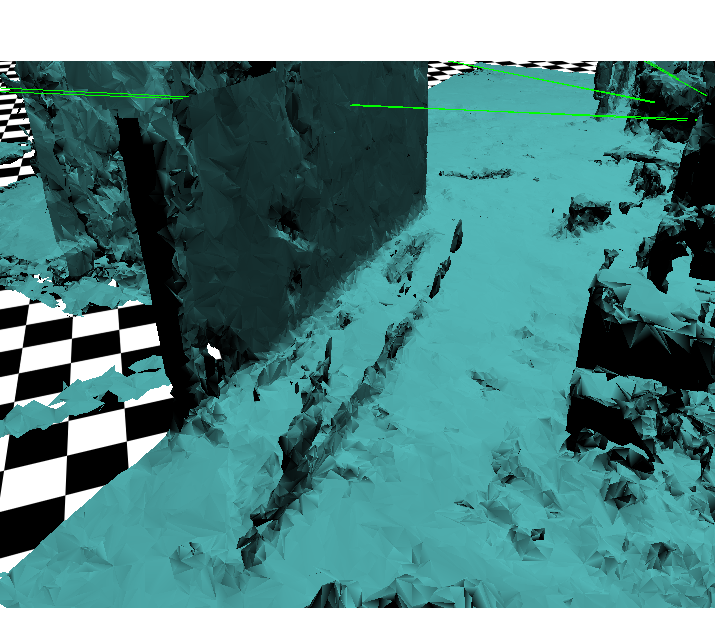 I have a question regarding the precision of the spatial mapping mesh. Often when I watch the mapping in unity the room gets recognized quite quickly, but some of the surfaces are off, sometimes even up to a meter. In some cases I scan a chair and the mesh fits fine, then I wander around in the room and come back to the same chair which was not moved in between, and the chair's mesh is off by a meter to one side. The whole room is usually not affected though, so it will not fix by adjusting the whole mesh, but it will lengthily rebuild the surfaces in question. This does affect world anchors as well, which is annoying when I put effort into accurately placing a hologram in relation to my real room, and the next time I open the app it has moved by a meter to either side. I attach some pictures. In the first one you can see a wall that is off by maybe 50 centimeters to the left. 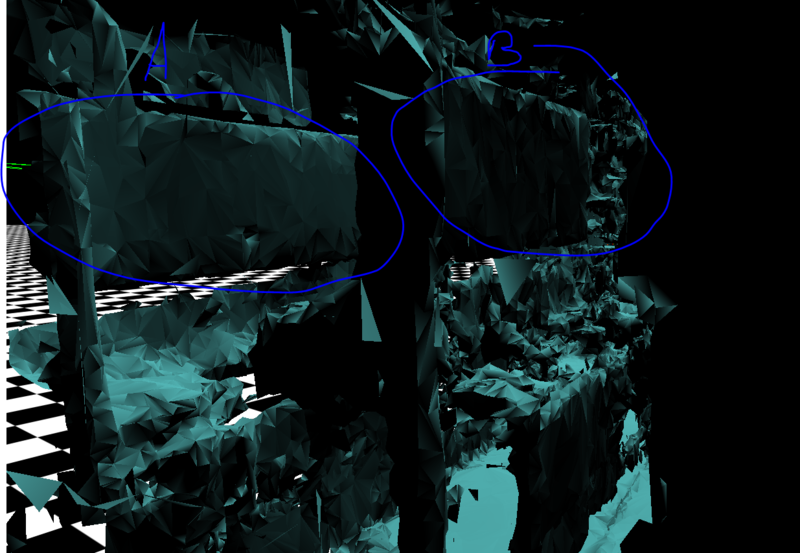 The second picture shows the room mesh from the device portal, and you can see a wall and on the ground the remains where this same wall got placed before and then was corrected. Is this normal behaviour? Can I do anything to improve this? Are there any official statements about the precision of the scanned room? I did run the sensor calibration various times. The room in question is quite large, I would estimate maybe 200 square meters, if this makes a difference. I also have a wall popping up in the middle of my room sometimes. The space I'm using the HoloLens in isn't that large though and it (usually?) happens when I've just turned on the HoloLens. The annoying thing is that in those cases I would expect the misaligned spatial map to snap into place once more data is gathered, but I have to walk up to and gaze at this ghost mesh to clean it up. 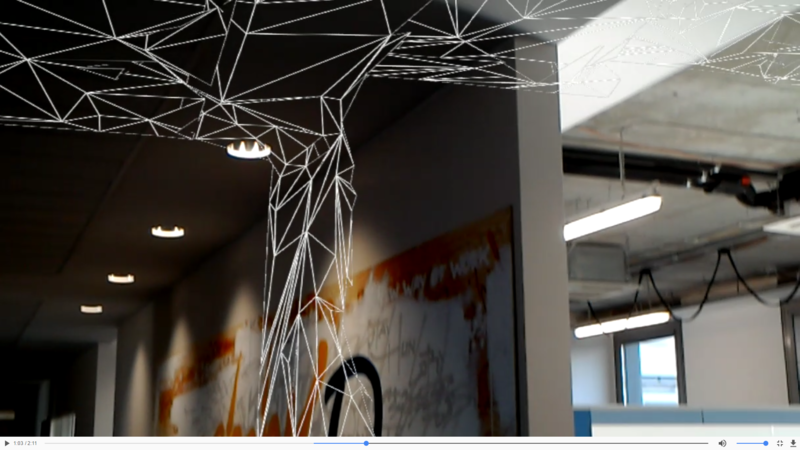 Even if the spatial mesh has already been updated with the wall where this ghost mesh originates from. Not sure if this is happening more frequently recently or that I just notice it more because I use the HoloLens more. Also I have to say lighting conditions in my space are not optimal. I've attached a screenshot of the problem I described in my previous post. It was hard to get an good angle for a screenshot, but hopefully you can see that the spatial mapping mesh has a row of cupboards duplicated. Version A is the old "ghost" mesh. But in this case I can't clean this mesh by walking up to it, because I can't physically go behind the cupboards. So this outdated mesh will keep being there. This is not a super big problem since the updated mesh will obscure it, but hopefully this illustrates the phenomenon walls and other objects popping up where they shouldn't. I understand spatial mapping is a complex problem, but it would at least be nice to know ways to reduce these occurrences. I have had good reliable results with spatial understanding, but sometimes I don't want to let the user scan the room before using the application. I have encountered the same problem. I am not sure but maybe if you use the "Simulated Update Periode" property of the "ObjectSurfaceObserver" you can force the mesh to be updated and therefore erase the "ghost" meshes.